For some clients, it may be a better choice than a donor-advised fund. Philanthropically minded donors often consider creating and funding a charitable organization that will make charitable grants with the objective of establishing a lasting legacy. Such donors quickly learn that in the United States,1 charitable organizations are divided into two categories—private foundations and public charities2—and that qualifying as a public charity (1) is more difficult, and (2) generally brings more generous limits on tax deductibility of contributions and more liberal restrictions on operations. Private grant-making foundations are saddled with restrictions not applicable to public charities, but qualifying as a publicly supported charity under Internal Revenue Code Sections 509(a)(1) and (a)(2) requires a commitment to fundraising3 that may be unacceptable to many donors. The 5 percent minimum distribution requirement applicable to private grant-making foundations may be too steep for some foundations with an asset base that’s short on cashflow. As a result, many philanthropically minded donors are choosing to fund donor-advised funds (DAFs) sponsored by public charities as the vehicle for their grant-making programs. Some see the lack of responsibility for the charity’s operations as a welcome trade for the loss of control, as compared to forming a foundation. But, other donors would prefer to form their own foundation and exercise greater control and involvement of their families in their philanthropic vision. Those donors should consider a private operating foundation (POF). The POF “threads the needle” through many of the most attractive attributes of public charities and private grant-making foundations. 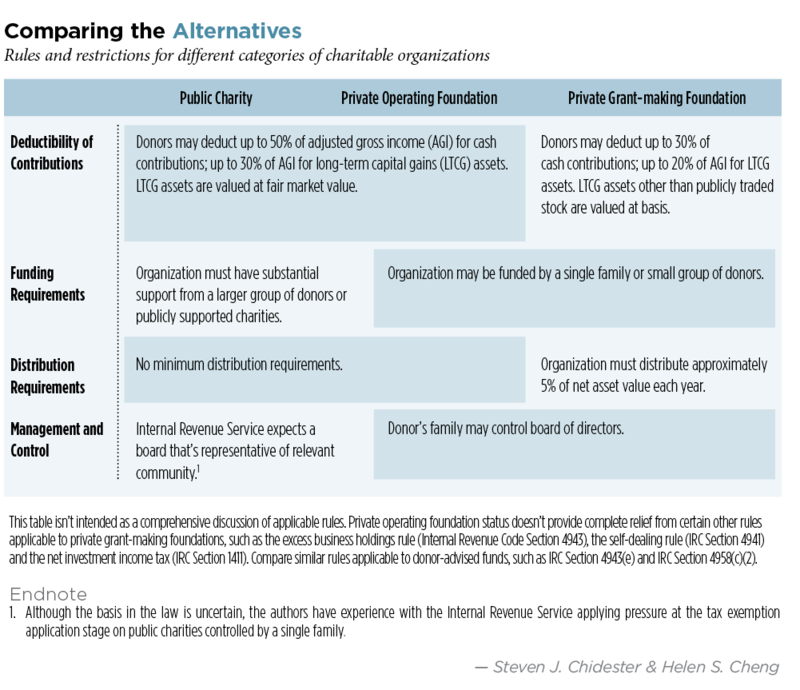 (See “Comparing the Alternatives,” p. 60, to contrast some of the relevant rules and restrictions for different categories of charitable organizations.) The POF has more operating flexibility than grant-making foundations in that it doesn’t have a minimum distribution requirement, and a donor to a POF enjoys the same deductibility limitations as for contributions to public charities. As the name connotes, a POF must have operations other than grant making. To qualify as a POF, a foundation must make distributions “directly for the active conduct” of its charitable activities at least equal to 85 percent of the lesser of its: (1) adjusted net income, or (2) minimum investment return (that is, approximately 5 percent of asset base).4 This requirement is referred to as the “income test.” Additionally, a POF must satisfy the assets test, the endowment test or the support test.5 Most POFs that come to these tests from the perspective of a grant-making foundation will apply the endowment test, which requires that a POF’s distributions directly for the active conduct of its exempt activities comprise at least two thirds of its minimum investment return.6 The result is that, instead of disbursing an amount equal to approximately 5 percent of its asset base in charitable grants each year, the POF spends an amount equal to approximately 31/3 percent of its asset base on its charitable operations. Amounts paid to cover in-house expenses of the POF’s charitable program count toward these tests. Examples are POF payroll for personnel involved in managing the charitable program, cost of materials and marketing. In cases in which the POF is disbursing money to third parties, the distinction between the POF’s active conduct of its own charitable activities, which counts toward the income and endowment tests, and making grants to support other charities’ programs, which doesn’t count toward the POF tests, becomes more difficult to draw. Whether the making or awarding of grants, scholarships or other payments constitutes qualifying distributions made directly for the active conduct of a POF’s exempt activities is to be determined on the basis of the facts and circumstances of each particular case. The test applied is a qualitative, rather than a strictly quantitative, one. Interestingly, even though the Treasury regulations state that grants to other organizations aren’t considered to be made directly in the active conduct of its exempt purposes, it does appear that payments to other organizations in the form of partnerships and service agreements may still qualify. The Internal Revenue Service has ruled that when a POF provides direct assistance to foster care children and invests in a public charity that provides assistance to these same children, the distributions to the public charity will qualify as direct distributions under the POF tests.13 In making this determination, the IRS stated that, “even where a private foundation has made a grant to another organization, if it maintains some significant involvement in the active conduct of the program the distributions will be considered having been made directly for the active conduct of its exempt purposes and the foundation will be considered a private operating foundation.”14 The key factor in this ruling appeared to be that the POF was actively involved in the establishment and operations of the public charity. Similarly, when a POF assisting families in low income communities made distributions directly to individuals and to other charities to reimburse them for assistance they provided to those same individuals, the reimbursements to the other charities qualified as “direct” contributions in furtherance of its charitable activities.15 Here, a primary factor appears to be the fact that the individuals being helped were specific and identified, and the POF reimbursed the charities for the services provided to such individuals. In essence, the payments were treated more like vendor services than a grant. When a POF rented half of its space at a senior center to other non-profit organizations, called “program partners,” it was able to include reimbursements to the program partners as direct expenditures relating to the POF’s exempt purposes.16 The payments to the program partners weren’t treated as grants, but rather as “reimbursements of expenses incurred in carrying on a joint program.” Again, the determining factor appears to be the joint nature and purpose of the programs. These private letter rulings provide insight on the application of the POF rules. Importantly, there appears to be a fundamental distinction between distributions characterized as “grants,” which don’t qualify as direct activities, and those characterized as “service payments,” which do qualify. The differentiating factor appears to be the level of involvement by the POF in the ultimate distribution of these funds. On one end of the spectrum, it’s clear that when a POF funds a grantee’s program and provides oversight only by reviewing the grantee’s periodic reports, the POF’s distributions wouldn’t be considered direct activities. The result would likely be the same regardless of how much effort the POF puts into the selection of the grantee and grant proposal. Thus, for example, if the POF were to accept proposals and simply select a favorite, or if the POF were to spend many hours studying a specific issue and crafting a request for proposal to address this issue, the grant would likely be considered “indirect,” if there were no additional involvement or participation other than simply reviewing the grant report at the end of the period. On the other end of the spectrum, if a POF makes direct gifts of food and clothing to poor individuals in a particular geographic area, those distributions are clearly direct. But, what if the POF doesn’t distribute such items directly to the individuals, but instead distributes food and clothing in bulk to a local shelter for distribution to individuals at the discretion of the shelter? What if the POF provides money to the shelter to purchase food or blankets for individuals? This answer would be based on the surrounding facts, but we believe that when a POF hasn’t directly identified a specific individual or individuals to be helped, the correlation between the POF and the payment to the individual may not be clear enough to be classified as a direct expense of the foundation’s charitable activity. If, however, the relationship between the POF and the shelter were slightly different, we might come to a different conclusion. For example, the POF could enter into an arrangement in which the shelter would agree to refer needy individuals to the POF. The POF would provide the shelter with program criteria and the targeted individuals, an application form (on POF letterhead) to confirm that the individual qualifies for the assistance and a checklist of items needed (for example, diapers and blankets). If and when the shelter identifies a needy individual, it would help the individual complete the application form and submit it to the POF on his behalf. The POF would then review the form and, if the individual meets the criteria, provide the individual with the requested items. Here, there’s a strong position that the shelter is simply a referral source and is assisting the POF in implementing its own program. Rather than having the POF purchase the items directly, the shelter could provide the items to the individual and seek reimbursement by the POF. Perhaps these reimbursements constitute the active conduct of the POF’s program in the same way as noted in the IRS’ PLRs on reimbursement. Although the determination of whether a distribution is direct is very fact intensive, we posit that, as long as the POF is actively involved in the planning and implementation of the program and training and monitoring the grantee organization on an ongoing basis, these funds could still be considered made directly to individuals, with the grantee organization simply acting as a service provider or program partner. 1. This distinction between charities based on sources of funding and activities isn’t found in the charities and tax laws of most other countries. 2. Our use of the term “public charity” here in the context of grant-making charities is focused on organizations that must satisfy the public support tests of Internal Revenue Code Sections 509(a)(1) and 509(a)(2). We won’t discuss the seven additional types of public charities: Five sub-categories of public charities escape classification as private foundations by virtue of their field of charitable endeavor under IRC Section 170(b)(1)(A)(i)-(v): churches, schools, hospitals, university foundations and states and municipalities; a sixth field-of-endeavor sub-category, the organization conducting testing for public safety, qualifies as a public charity under Section 509(a)(4); and supporting organizations qualify as public charities under Section 509(a)(3) based on their relationships with other public charities. 3. In general, the public support test applicable to Section 509(a)(1) and (a)(2) organizations requires that the organizations raise approximately 50 cents from the public for every dollar contributed by the founder’s family. 4. See IRC Section 4942(j)(3)(A). 6. Under the assets test, 65 percent or more of a private operating foundation’s (POF) assets must be devoted to the active conduct of its exempt activities. Under the support test, (1) at least 85 percent of the POF’s support, other than gross investment income, must be received from a combination of the general public and five or more exempt organizations with not more than 25 percent of support, other than gross investment income, from any one exempt organization, and (2) not more than 50 percent of support may be from gross investment income. We won’t go into further detail on these tests, as they’re outside of the scope of this article. See Section 4942(j)(3) for more information on these tests. 7. Treasury Regulations Section 53.4942(b)-1(b)(1). 9. Treas. Regs. Section 53.4942(b)-1(b)(2)(i). 10. Treas. Regs. Section 53.4942(b)-1(b)(2)(ii)(A). 11. Treas. Regs. Section 53.4942(b)-1(b)(2)(ii)(B). 12. Treas. Regs. Section 53.4942(b)-1(d), Example 8. 13. Private Letter Ruling 199947038 (Aug. 30, 1999). 15. PLR 9203004 (Aug. 9, 1991). 16. PLR 9723047 (March 12, 1997). 17. PLR 200252098 (Oct. 1, 2002).